I had my first chai latte the other day. You’re probably wondering what planet I’ve been on since the chai craze hit this city a few years back… I assure you, I’ve been here, on planet Earth. It’s just that I’m more of a coffee drinker. For me the thought of white fruity tea evokes the same stomach-churnig emotions as frozen spinach and Brussels sprouts do for others. Having warmed up to the concept of having fruity tea with warm milk, I was now left to concoct my own version of the drink that would be just as nice but added-sugar-free. After all, fruity teas are not at all bitter, and milk has its own sugar in the form of lactose already. What I’ve discovered about chai since making my own is that on the coldest 12th of May in 50 years, when the temperature in Sydney dropped to 7C (45F), it worked better to warm me up than any hot water bottle ever would. It was a perfect mix of summery flavours of mango in the tea, spices that invoke thoughts of only the warmest corners of the Earth and the comforting creaminess of frothy milk. Best of all, my homemade version contains no additives and no added sugar apart from a little teaspoon of pure organic honey. So different to commercially made chai mixes, and so easy to make! You can even have a small spice mix at work and make the lot in a microwave! 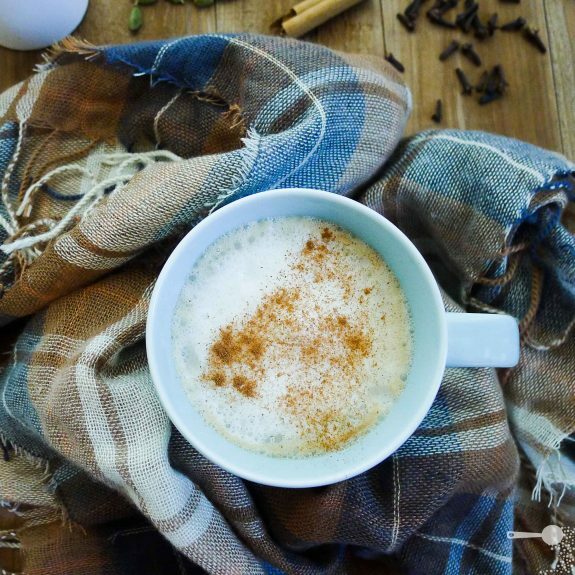 Completely natural and additive free, this chai latte recipe is easy to make both at home and at the office, including frothy milk. It can be made using your favourite tea or herbal infusion, too. My personal favourites include mango, vanilla and blackcurrant teas. And you can adjust the level of sweetness to your own tastes as well. Place tea bag into a small saucepan and cover with 3/4 cup freshly boiled water. Allow to infuse for 3 minutes. Add milk, spices, honey and bring to a boil. Turn down the heat and simmer for 3 minutes. In the meantime, pour the other milk (1/8 cup) into a tall glass and whisk using a stick blender to make froth. Note: skim or 2% milk will froth easier than full cream milk as it is lighter. Using a strainer, pour hot tea, milk and spices mixture into a mug. Top with frothy milk and sprinkle with extra cinnamon. Keep your whole spices - cloves and cardamom in small zip lock bags. Place all spices in a small tea infuser and allow to soak in your favourite tea for 3-5 minutes. Top with milk and heat in the microwave for an extra 30 seconds if necessary. To make frothy milk, put 1/8 cup of milk in a plastic water bottle and shake, shake, shak for about 10 seconds. Pour into your chai latte and there you have it: frothy milk topping! Yummo – this sounds delightful! A lovely chai latte if i ever saw one considering how overly sweet some of them can be this sounds terrific. I love that you made your own chai – and what a beautiful flavour it must have been with the mango addition! Far less sugar, you’re right. I love my chai with soy milk. Thanks Heidi. I’m yet to get used to the flavour of soy milk. I use rice milk sometimes (it tastes great, a little like rice pudding…mmm). Wow! Never thought of mango and chai, but I can imagine it would definitely work. This sounds so tasty I’ll have to try it! I saw a comment of yours on Heidi ‘Apples under my bed’s blog and came to have a peek on your blog…the fact that you had a recipe for chai tea on the first page won me over! And my sentiments exactly, I love a good chai latte but all the cafes make it from a powder that is way too sweet for my tastes. Thank you so much for this recipe, I look forward to making some this week! You make it too simple not to!